Looking for a cheap broker with excellent service? Check out TradeKing. It is an online discount broker which charges a flat $4.95 commission for every stock trade. Also, TradeKing has been ranked No. 1 Online Discount Broker by SmartMoney Magazine for two consecutive years in 2006 to 2007. 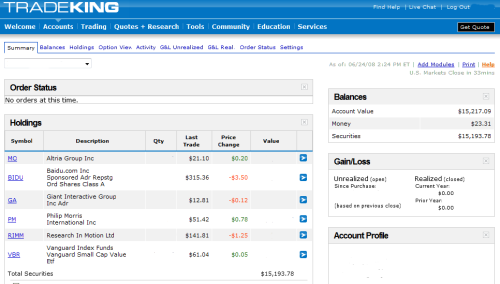 I have wanted to write a review of TradeKing for very long, but kept postponing it. 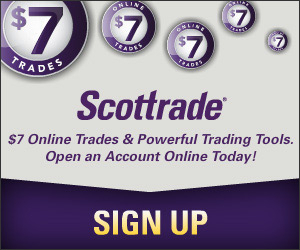 One of the reasons is that I don’t use TradeKing as often as I do with Scottrade or Zecco. Firstrade also has a nice, easy-to-use website and allows customers to reinvest dividends for free, but its commission ($6.95) is higher than TradeKing’s ($4.95). TradeKing charges a flat $4.95 commission for stock trades, regardless the order (market or limit) or the size of the order. For option trades, the commission is $4.95 plus $0.65 per contract. Comparing to other discount brokers, though TradeKing’s commission isn’t the lowest (as of I know, two are lower: Zecco charges $0 commission for up to 10 trades per month and SogoTrade has a $3 per trade standard plan), it doesn’t require a minimum for opening an account (Zecco requires $2,500 minimum), which is a plus for investors with small money. In addition to stocks, TradeKing also offers mutual funds from about 235 fund families, including well-known names such as Dodge & Cox, Fidelity, T. R. Price, and Vanguard, etc. However, since buying and selling mutual funds with brokers involve additional cost, I usually recommend go directly with the fund company, as I discussed in my IRA guide post. At TradeKing, the cost for each mutual transaction is $14.95. What I like about the trading interface (click picture below to enlarge) is that it show it shows the quote immediately after the stock symbol is typed in, making trading in TradeKing a lot easier. In Scottrade or Zecco, the quote and the order form are not on the same page, a little bit inconvenience. For all the discount brokers I am using, I feel that orders are always executed immediately and that’s true for TradeKing as well. In fact, from what I can see, there isn’t noticeable difference in the way orders are executed at different brokers, not that it really matters if the order is delayed a few seconds. To make trading and researching on stocks/mutual funds/ETfs easier, TradeKing provides its customers a range of research tools. For stock research, TradeKing uses a tool provided by MarketGrader.com to generate detailed research reports for individual stocks. The best part of this report is that it gives the fundamentals of the stock, such as Growth, Value, Profitability, and Cash Flow, in an easy-to-understand grade format. In addition to stock research, TradeKing’s research tools also include a mutual fund center and an ETF center, allowing investors to screen mutual funds and ETFs. For mutual funds, there are four screeners powered by Thomson Financial: High Net Assets – Equity Funds, High Net Assets – Fixed Income Funds, Foreign Equity Performers, and Low Turnover Top Performing Equity Funds. The ETF Center also features four screeners: Income Producing ETFs, Top Performing International ETFs, YTD Top Performing ETFs, and High Yielding Bond ETFs. For investors who are new to exchange-traded funds, TradeKing also has an ETF Education section providing basic knowledge. Nowadays, the word “social” is very popular, even stock brokers like TradeKing and Zecco are no exception. Both have them own community (other websites have also built similar communities that are not limited to a certain broker) to let their customers share their trading ideas and portfolios and be interactive with their fellow investors. Overall, I feel that TradeKing is truly a discount broker that doesn’t sacrifice its service for being “cheap.” In a recent SmartMoney broker survey, TradeKing received the highest mark in customer service. I only contacted TradeKing a couple of times via their Live Chat (a very nice tool, BTW) and my issues, including setting up dividend reinvestment, were resolved quickly. Though I didn’t use TradeKing a lot, my experience so far has been very positive. If you are interested in opening a brokerage account with TradeKing, use any of the TradeKing promotion codes below to open an account and start trading. That was a very thorough and informative review – thank you for posting! I’ve been a Scottrade customer for a few years and I absolutely love them other than the fact that they don’t offer dividend reinvestment, but that’s a huge setback as far as I’m concerned. I jumped on the Zecco bandwagon about a year or so ago, but like you said, their website is so disorganized and unusable, I completely gave up on it. As soon as I’m ready to jump back into the stock market, I’m going to give TradeKing serious consideration. This review was helpful– thanks! Tradeking will give you hell in taking your money out and they are very misleading whoever is with tradeking now you will see for yourself just remember this post try to take money out and you will see how frustrated you will get and regret ever signing up with them. i have been using reliance money demat account. 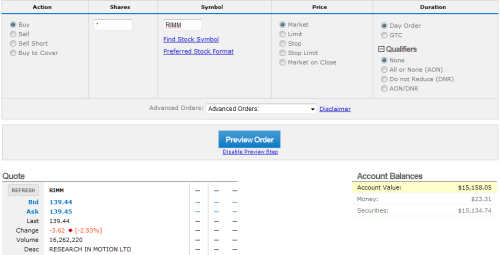 the trading on this platform has been quite problem free.. some glitches .. but still going strong for me.. The impact high fees can have on the return of your investment account gets understated — I’m glad you stressed it though. Great customer service, although hard to quantify, can really prevent headaches when random problems arise. I will consider TradeKing simply because of this review.